I've had this post in my Drafts folder for months and never got around to posting it. The weird thing is how much of these ideas filtered into other game ideas in the mean time. So anyhoo, here is some designerly stuff to chew on today. I'm a big fan of any players simultaneously revealing a secret choice. It creates a nice rhythm to play and keeps all players engaged at the same time. When options are limited, it creates an especially savory deductive tension. I long time ago, I noted a little hack for Rock Paper Scissors that works a little like this. Scissors: Score 1pt per Paper. Track with off-hand. First to 5 wins. Cards that interact with Events. Cards that interact with Buildings. Mixing and matching these ingredients, I can see a small deck of cards building already. Assume each player begins with an identical deck of cards as listed below. The game lasts three rounds. Each round lasts five turns. 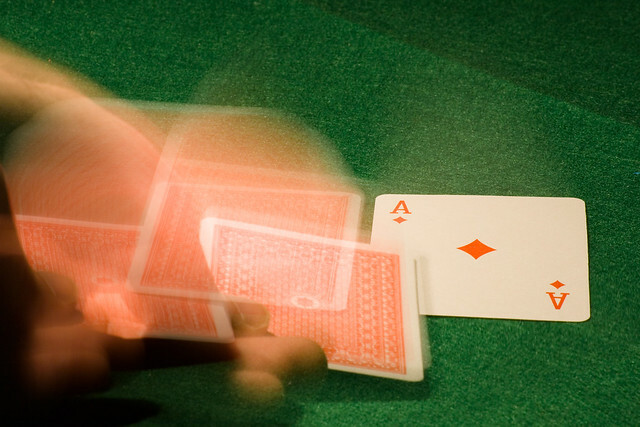 At the start of each round, each player randomly draws six cards into her hand. Each turn, all players choose one card from their hand and place it face down on the table. Then, all players reveal their chosen card and resolve each of their effects. 2x RAIN (Event): Gain 1 pt per RAIN revealed this turn. 1x STORAGE (Building): You can possess up to six FOOD. 1x HOUSE (Building): At end of round, score 1pt per FOOD in your possession. 2x TOUR (Event): Gain 1pt per Building in play. 1x THIEVES (Event): Score 1pt per unprotected Building in play. 2x GARRISON (Building): Buildings to the left and right of this card are PROTECTED. 2x QUORUM: (Event): Score 3pts per QUORUM revealed this turn. 1x DEMOLITION (Event): Discard one building in play. It may be yours or an opponent's. 1x JUBILEE (Event): Draw one card from your discard deck back into your hand. 1x COOP (Building): Gain 1pt and one FOOD per turn if this is the only CHICKEN COOP in play. Gain one FOOD per turn thereafter. 1x MARKET (Building): You may discard one FOOD per turn to score 1pt. 1x CAPITOL (Building): Gain 3pts at end of round if you possess CAPITOL. Of course this basically ends up being a 7 Wonders without the card draft, which isn't nearly as interesting. Just a thought for now.